We pleased to announce we’ve partnered with Warner Bros. Home Entertainment to offer the chance for one lucky reader to win the all-new movie The Flintstones and WWE – Stone Age Smackdown Blu-ray Combo Pack, which includes a standard DVD and HD Digital Copy. 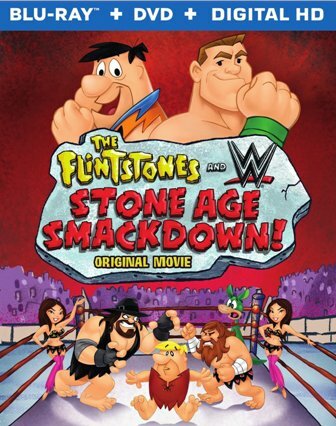 This animated crossover, featuring your favorite characters from the town of Bedrock along with popular WWE superstars, is available to own (on Blu-ray Combo Pack, DVD, and Digital HD) from Warner Bros. Home Entertainment on March 10, 2015 (timed to debut leading into WrestleMania 31). To enter for a chance to win The Flintstones and WWE – Stone Age Smackdown, use the Rafflecopter form below by March 23, 2015 (U.S. residents, 18+ only). Special Features: two all-new featurettes and two vintage Flintstones episodes. I like the Flintstones, Thanks for the giveaway. I hope that I win. Yes, I like the Flintstones. I always use to watch them when I was young. Thank you for the chance to win this. My favorite is Fred. I would like to win this for my grandson. It would be fun to watch it with him. Tell us who your favorite Flintstones character is! I like Barney Rubble the most.